Need an easy make-ahead breakfast idea? Try these low FODMAP raspberry muffins. These freezer-friendly muffins are perfect for a busy morning on the go, or a leisurely FODMAP friendly brunch. Light and fluffy, no one will know they’re low FODMAP. My husband is obsessed with these low FODMAP raspberry muffins. He isn’t normally a breakfast person. But, when these are on the menu, he’s up bright-eyed and bushy-tailed every morning until we run out. Needless to say, they’re a family favourite. If raspberries aren’t your thing, don’t worry. You can swap them out for any other low FODMAP berry of your choice. If you’re looking for something a little sweeter, you can also make these muffins with low FODMAP chocolate chips. Think these low FODMAP raspberry muffins sound great, but you don’t have time to try them now? Don’t worry. You can PIN THIS POST for later. These low FODMAP raspberry muffins will add a fresh splash of flavour to your mornings. Check out the notes below for tips on keeping this recipe FODMAP friendly. If you’re in the elimination phase, you need to use gluten-free flour. For my Canadian peeps, I like using PC’s all-purpose gluten-free flour. I like it because I can use it cup for cup and it doesn’t have any gums. You’ll also need to use a lactose-free milk. The fat percentage isn’t important for this recipe, so you can use whatever’s handy. Last but not least is raspberries. According to Monash University, raspberries are low FODMAP in servings of 10 berries. Servings of 20 berries or more are high in fructans, so you need to keep track of how many you eat. While it would be hard to fit 20 raspberries in a single muffin, this information is important if you’re eating multiple muffins or you’re having them as part of a larger meal. I normally pick a specific number and make sure all of my muffins have the same amount of berries (my magic number is five). That way, I always know how many berries I’ve eaten per muffin. Want to try these low FODMAP raspberry muffins? You can PIN THIS RECIPE for later. Looking for an easy make-ahead breakfast idea? 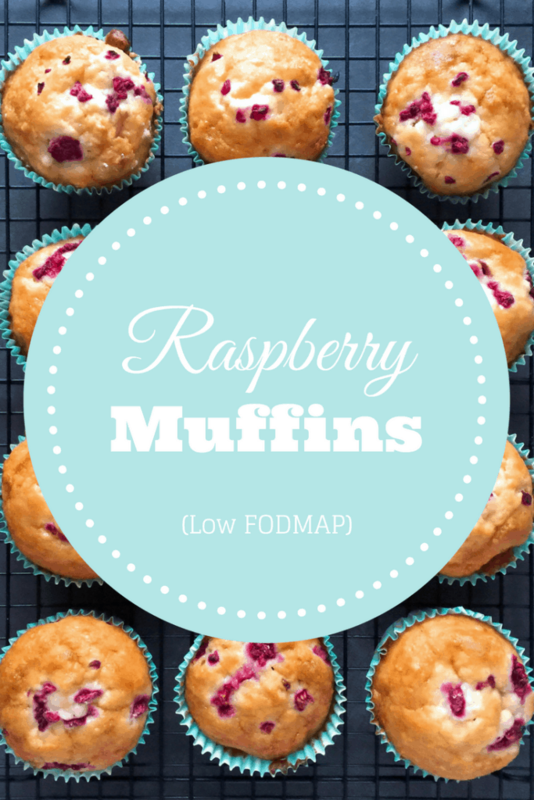 Try these Low FODMAP Raspberry Muffins! They're ready in a flash and are freezer-friendly. Preheat oven to 400 degrees and line a muffin tray. Set aside. Place flour, baking powder, salt, and sugar in a large bowl and mix well. Place the egg in a small bowl and whisk gently. Add milk and vegetable oil and whisk again. Make a well in the dry mixture and add the wet ingredients all at once. Mix as quickly and gently as possible with a fork until the batter is just moistened. Place a few raspberries in the bottom of each muffin liner and cover with 1/4 cup of batter. Bake for 23-25 minutes or until a toothpick inserted in the center of a muffin comes out clean. Cool on a wire rack. This recipe freezes really well. If you want to make multiple batches and freeze them, I recommend wrapping each muffin individually before freezing for the best results. Make sure the muffins have cooled completely before you wrap them to prevent freezer burn. These low FODMAP raspberry muffins will get your morning off to the right start. If you like this recipe, sign up for my mailing list below. You’ll get new recipes and articles delivered right to your inbox. Looking for more information on the Low FODMAP Diet? Follow me on Facebook for more articles and research on managing Irritable Bowel Syndrome and the low FODMAP program. Together we’ll get the Low FODMAP Diet down to a science! I’m new to the low-FODMAP thing and due to my feelings about substituting ingredients, I wasn’t expecting much out of these. But I ate them up pretty darned fast! They were surprisingly moist. I made them with fresh blueberries instead of raspberries. I’ll be making them again in the future. Thanks for the recipe. Thanks for your feedback. I’m glad you enjoyed them. Let me know if you try any other flavours as well! I made them with raspberries and they were just as good. I am now making them for a third time. I think we have a hit! I’m so glad they’re working out for you. It’s always nice to hear a recipe has become a new family favourite! This recipe looks delicious! I’m new to the FODMAP diet and haven’t tried lactose drops in milk yet. Would it be ok to use Almond milk in the recipe instead as a substitution or no? Thanks! I’m so happy you want to give this recipe a try. It’s one of my favourites for sure. I don’t do well with almond milk, so I haven’t tried it personally. I checked the Monash app for you and from a FODMAP standpoint, it would be fine. There would likely be a slightly different taste, but it might be great. Definitely, give it a try and let me know how they turn out. I’m really curious now. I made these with a few adaptions. Having been through the fodmap process, I know flour isn’t a problem but milk is. So AP flour, and silk coconut milk where used. I also reduced sugar to 1/2 cup and added 1 tsp vanilla. Turned out really well. Thanks for a base recipe on which to work. I’m glad you were able to make them work for you! Thanks for bringing back your feedback as well!! It’s always helpful to see how people adapt each recipe to meet their personal needs. I made this recipe exactly as written, placing a few raspberries in the baking cup first. However, the raspberries just stayed on the bottom and looks nothing like your final picture. Please tell me what I did wrong? I sprinkled some raspberry crumbs on top of the muffins in the photo. So, you didn’t do anything incorrectly if they don’t look exactly as shown. When you open the muffins, did any of the raspberries pop up? Or did they all stay completely on the bottom? If they were stuck to the bottom, try making the batter a little lighter and breaking your raspberries into smaller pieces. Depending on the flour blend you used, the batter may have weighed them down. If things are working correctly, the larger raspberries may stay near the bottom while the smaller ones will float up about half-way.